As an image-development and design firm, we encourage our clients to provide input in all aspects of the progression of their brand, including the design of their business cards, but we also recommend allowing the design firm you employ to steer your creative energies and guide you with tried and true design practices. In an age when nearly all information is transferred electronically, including signatures, it seems unlikely that the traditional paper business card could maintain its relevance in the business world. When two businesspeople meet, the first thing that occurs after the handshake is an exchange of business cards. It has all your information in one place, from your address to where you are on social media. Business cards tie your identity with that of your business. It contains your title, which may be difficult for clients to recall after the initial meeting. All your contact phone numbers, including your office, extension, fax and cell can be listed on the card. Your name, title and company’s name are all listed on the card, properly spelled for reference. If that seems like a lot of information to be placed on a 2” x 3” business card, it is, which is why it’s essential to have your card designed by a professional to avoid having it appear confusing or cluttered. If you retain the services of a top-tier graphic design firm to help you develop your firm’s outward image, their team should plan all illustration, packaging and design with big picture brand-development in mind. That means the concept for signage and advertising should dovetail with your business cards. Did you know the standard size of business cards varies from nation to nation? In the United States and Canada, business cards are 89 millimeters in width and 51 millimeters in height, which is approximately 3” x 2”. If you choose an unconventional card size, you may find it difficult to find caddies, card cases and other card accessories that properly fit your business cards. More importantly, you may get an adverse reaction from clients and business acquaintances when they can’t deftly slide your card into a slot in their wallet. Your business card’s thickness is largely a result of the type of paper stock you choose. The thickness of business cards is measured in points. Each point is one-thousandth of an inch thick. The standard point range for business cards is 8 – 14 points. Cards from 8 – 11 points are flimsy, and cards from 12 – 14 points tend to be firmer. Often, designers can achieve a thicker or thinner feel by using heavier paper stock. This refers to the physical weight of the paper used to make the business cards. Weight is often used interchangeably with thickness by the uninitiated because heavier paper also tends to be thicker, but this isn’t always the case. The weight of the paper used to make cards is 50 – 140 pounds for card stock and 20 – 80 pounds for bond paper. Card Stock vs. Bond Paper. Card stock is the more popular choice for business cards. It has the same feel and consistency as a greeting card. It holds its form and doesn’t bend as easily as bond paper. Bond paper possesses a rag content and is like the paper used in money and other financial instruments. Bond paper creases and folds more easily than card stock. Bond paper isn’t as common for business cards because it feels less substantial. Paper business cards come in matte or glossy finishes. If your card’s design calls for a photograph to be displayed on it or a wide array of colors, you may want to select a glossy finish. Matte finishes work well with simpler business cards and have more of a traditional appearance. The sheen from a glossier business card can make it more difficult to read the print, so that needs to be considered. Because there are so many fonts available for business cards, it’s an area where you can get yourself in a lot of trouble without proper guidance. Fonts that are too fancy or whimsical can be distracting and make the information on your card difficult to read. Select a font that’s consistent with the tone of your industry. A lawyer or accountant may want a different look than a beer and wine distributor or a restaurant manager. Furthermore, the font shouldn’t wildly conflict with your logo. If you have, a coat of arms as your logo, it might look odd nested among Ailerons or Modeka fonts. Combining multiple fonts on the same card is generally not considered a good practice. Find a single font that works with existing logos and signage. Business card real estate is a precious commodity. The larger your font size the fewer pieces of information you’ll be able to include on your card. Additionally, large fonts can make the card appear cluttered. Unless you’re in an industry where the opposite is likely to be true, assume your readers have close to normal vision. Your general information should be no larger than 10 – 11 points, and your contact info can be around 7 – 8 points. Modern printers can produce nearly any color scheme you request, but that doesn’t mean all color schemes and combinations are a good idea. Generally, the printed information on your card should stand out against the background. Raised ink can give your business cards an expensive, substantial feel. Some businesses have departed from traditional business card materials and have opted for plastic, metal and other alternative materials. If you decide to use a non-conventional material, keep in mind the primary function of the card is to deliver contact information about you and your business to colleagues and clients. Make certain your card still serves that purpose. Whether you want the impressions of your business cards to be professional and traditional or fun and whimsical, it’s essential that you don’t focus so much on designing clever business cards that you leave out essential contact information. While there are some exceptions to the established rules, professional business cards contain the same fundamental information from industry to industry. Your logo should immediately identify your company to clients, customers and competitors, so it should also figure prominently on your business cards. This can present a challenge for the graphic designers if you have an overly elaborate logo design, but those are the obstacles they’re trained to overcome. If your business has a great tagline, it should also be on the card. 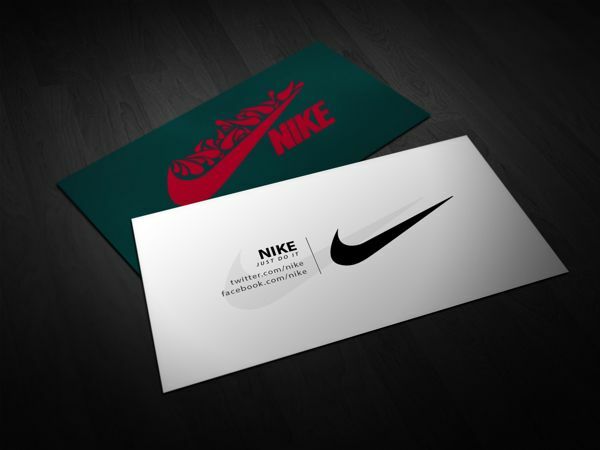 Can you imagine a Nike executive’s business card without their famous Swoosh and the words “Just Do It” somewhere on it? Branding requires a commitment to the visual images and words associated with your company. Make sure this extends to your business card. Some businesses work their name into the logo, but it’s essential that it appear somewhere on the card. If you receive one business card per day, you might not have any problem remembering that Mary Smith is a representative for XYZ Corp, but if you were to collect twenty cards at a trade conference, you’d have to have a photographic memory to match each face, name and business. While almost everyone remembers to include their names somewhere prominently on their business cards, the same can’t always be said about their titles or about the positioning of their titles with respect to their names. Both your name and your title should be closely connected on your card. Usually, your title appears after or below your name. You might think by not including your title, you won’t have to discard old cards when you receive your next promotion, but not finding a title on a card can be frustrating to clients and colleagues. This can be your physical address, the address of your headquarters or a mailing address. If you don’t have any direct contact with colleagues and clients at your work location, a mailing address may suffice. If you have multiple addresses, select the one that’s most relevant, as addresses tend to take up a lot of area on the business card. If the address your listing is anything other than your business’s headquarters, you may want to make that clear on the card. Over the past two decades, your professional email address has become an essential piece of information. In many companies, email is the official means of communication for sending and receiving documents, scheduling meetings and issuing directives, among other things. Even if your business’s culture isn’t as heavily reliant on email, it’s important for business associates to be able to reach you by email. Your webpage should be listed on your business card. You can list the URL without the https:// prefix to save space and make the address appear cleaner. For instance, www.xyzcorp.com. This is the area where many do-it-yourself card designers ruin what would otherwise be professional-quality business cards. Either they opt for too many or select the wrong ones for their industry. Selecting the right options can distinguish your card in a positive way. Raised lettering. Raised letters appear more polished and upscale. Watermark. This can be your logo if it isn’t already on the card or something that complements it. Background art. Art shouldn’t obscure your info. Be sure all parts of the text are readable. A photograph. Add a portrait on the card, a photo of your business or a picture of the product. Printing on revise side. If important information is listed on the reverse side, it should be easy to find. Alternate materials. Alternate materials can be more expensive but may make your cards stand out. Textured surfaces. Printers are changing the texture of surfaces with both the type of card stock and by using raised ink to form shapes and patterns. Remember when selecting features to make certain they won’t obscure the information on the business card. The most important aspect of a business card is its clarity to readers. Trying to contact someone via the information on their card and getting the runaround can be frustrating. It’s important that your business cards have your accurate contact information. If you want clients to contact you via an 800 number or an office line, include your extension. Otherwise, list a cellphone number. If you list a fax machine, it should be one that will deliver documents to your office or work area. That can be a lot of information. One or more details can change from one week to the next, making your business cards obsolete. If you have your cards printed and your title, office address and desk phone number all change, you may need to reprint your cards. Consider which information is essential for your business card. You may not need to list a fax number — few companies rely on them anymore. If that’s the case, leave it off. Additionally, if you are anticipating a name change, title change or something else that will invalidate the information you’re about to put on the card, delay printing your cards. For years, The NetMen Corp has been assisting businesses of all sizes realize their branding goals. We are a professional graphic design company for businesses and professionals who want to achieve a polished image. We customize our designs to suit the needs of our clients and work tirelessly to ensure satisfaction. For more information, contact one of our design consultants.